If you are searching for unique and fun activities to enjoy this winter, then look no further than beautiful Colorado! Winter is nearly upon us and to prepare for its arrival, listed are 8 things to do in Colorado this winter! This winter, try one of the many snowmobile tours offered throughout Colorado. Snowmobiling is offered for both experienced and inexperienced drivers. Many snowmobile tours provide you with a tutorial covering the operation of your snowmobile and allow you some practice time with it prior to your tour’s departure. Grand Adventures offers tours that top out at nearly 12,000 feet with views of the entire Winter Park Ski area and the Fraser Valley. Tour options are available for all abilities from beginner to advanced. They even offer Kids Snowmobiling tours with mini snowmobiles made especially for kids ages four to twelve. 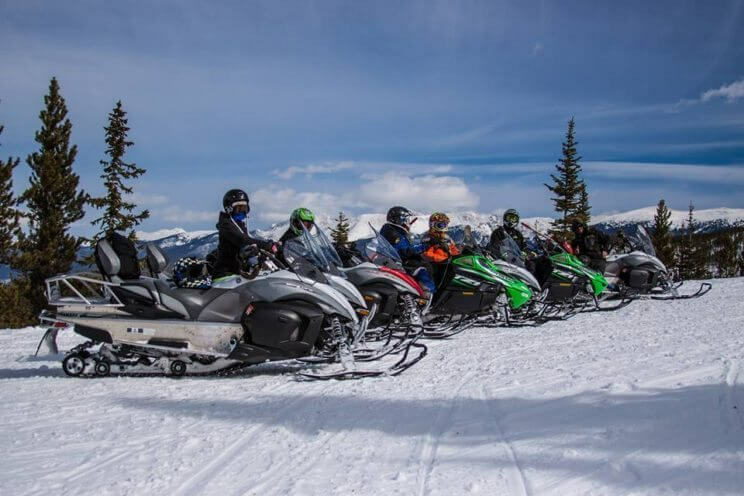 Breckenridge Snowmobiling Tours & Rentals offers an adventurous escape into the heart of the Colorado Rockies, with miles of perfectly groomed trails and endless powder-filled bowls and meadows to explore. If you want to ride with the entire family, then try Boulder Outdoor Center‘s Family Snowmobile Tours, that offers a two hour snowmobile tour perfect for families and for all ages. You will enjoy a groomed trail system as well as large open meadows, great for play riding! Make your holiday season extra special with a ride on a horse-drawn sleigh! Dashing Thru The Snow, a family owned and operated business, located in Winter Park, offers horse-drawn sleigh rides. Enjoy a special day where you and your family have the opportunity to dash through secluded woods and meadows in their old-fashioned sleighs. 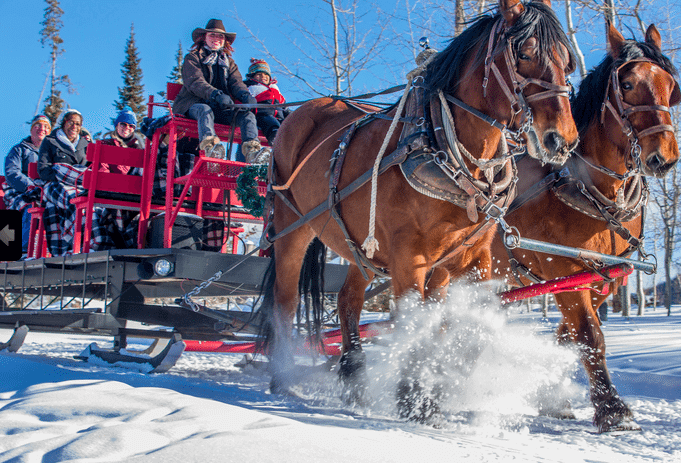 Snuggle under warm woolen blankets and relax to the sound of bells jingling as their team of gentle-giant draft horses carry your sleigh over historic glistening snow-covered trails. After the ride, warm up by the fire while sipping hot cocoa and roasting marshmallows while the kids play on the sledding hill! Sombrero Stables at Snow Mountain Ranch/YMCA offers a variety of horse-drawn sleigh rides. Try their ‘Hot Cocoa Sleigh Ride’, where you ride through snow-covered meadows to the sounds of caroling, and covered in a warm blanket. Disembark to a crackling campfire, hot chocolate, and marshmallows for your toasting pleasure. If you are looking for a way to treat your date to one-of-a-kind romantic dinner, then try their ‘Dinner Sleigh Rides’, that take you on 45-minute looped sleigh ride under the stars, bundled in blankets, ending at a cozy western dining hall that will serve you home-cooking with your choice of chicken, steak, or trout as an entrée! If so far you’ve associated thrill and speed rides with the summer months, then think again! There are many thrill and amusement rides you can enjoy in Colorado during the winter months. The Forest Flyer™ Mountain Coaster, located at Adventure Ridge in Vail Valley, is an alpine coaster that winds its way 3,400 feet down the mountain, following the natural contours of the landscape through the forest. Breckenridge Ski Resort features the Gold Runner Alpine Coaster, where you and a friend can ride down the mountain on 2,500 feet of coaster track. It also offers the Breck Flyer Zipline, where you can fly through the air and over the runs soaring over 50 feet in the air! 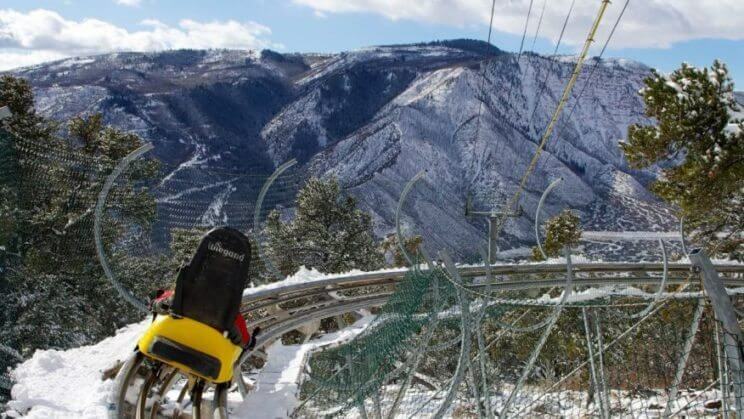 If you were hoping for a full day of rides at an amusement park, then look no further than Glenwood Caverns Adventure Park, that is open during the winter months, and features six thrill rides and many attractions. 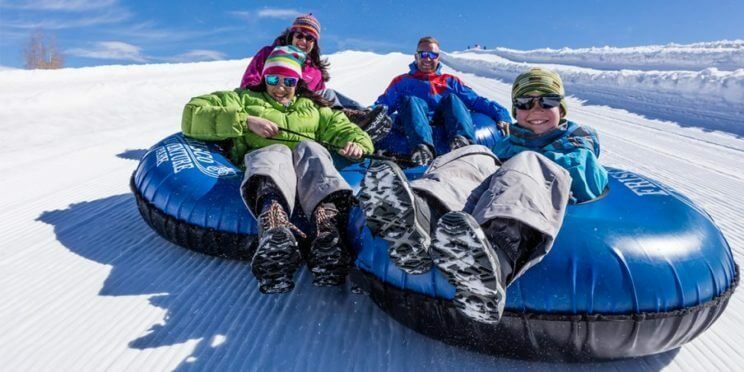 Ride down Tubing Hill at Frisco Adventure Park! Tubing Hill features lengthy 1200-foot tubing lanes with lift service up the hill. This fun winter activity is suitable for adults and kids alike, and opens this season on Thanksgiving Day, November 23rd, 2017. If you are searching for a unique way to celebrate your child’s birthday this year, then consider the park’s Tubing Birthday Parties. The party package includes one hour of tubing, followed by two hours at their Day Lodge. Torchlight Parades are special parades where skiers and snow vehicles are bedecked with lights that stream down the mountain in creative formations. Winter Park‘s annual Christmas Eve Torchlight Parade will kick-off with carols around the bonfire at the base of Winter Park Resort, followed by a procession of torch-bearing skiers and riders that will begin their way down Lower Hughes trail, followed by Santa Claus and his merry helpers. A spectacular fireworks display and snowcats adorned with Christmas colors will light up the slopes in a Christmas tree formation to conclude the festivities. Snowmass‘ annual Torchlight Parade for New Year’s Eve invites moms, dads and kids ages eight and older to be part of the trail of light down the mountain. Stick around as pyrotechnics illuminate the night sky later that evening with musical accompaniment in both the Snowmass Mall and Base Village. 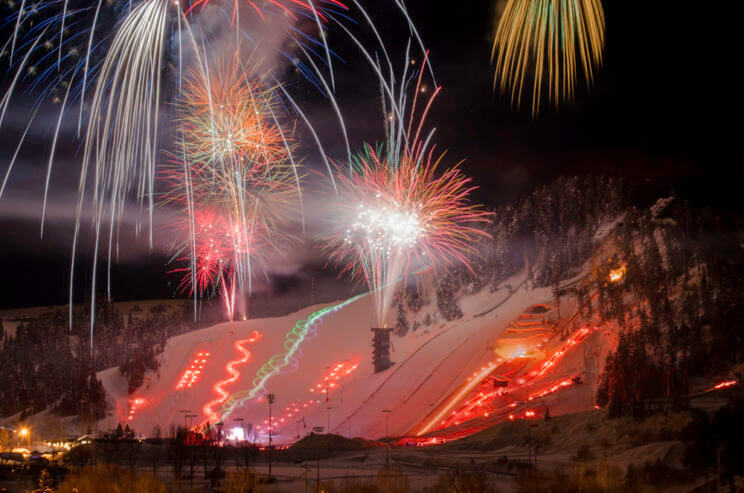 Steamboat Springs will feature a spectacular on-snow Torchlight Parade down the mountain lit only by torches followed by a fireworks display, on Valentine’s Day. For more torchlight parades around Colorado, check out Visit Colorado‘s ‘Night Activities at Colorado Ski Resorts‘. Carnivals are a great way to enjoy the winter season. Many Colorado towns and villages are hosting special winter carnivals this season. Breckenridge hosts the Ullr Fest, a tribute to Ullr, the Norse God of Snow, a week of snow celebration including Ullympics, Dating Game, parade, music, ice skating party and more. Steamboat Springs‘ annual Winter Carnival has been the town’s tradition for over 104 years! The carnival takes place from February 6th through February 10th, 2019, and features multiple events for all ages, including the crowd favorite, the “Donkey Jump”, that sends kids soaring off a jump for up to 40/50 feet! Traveling aboard a train is a unique experience during the holiday season. 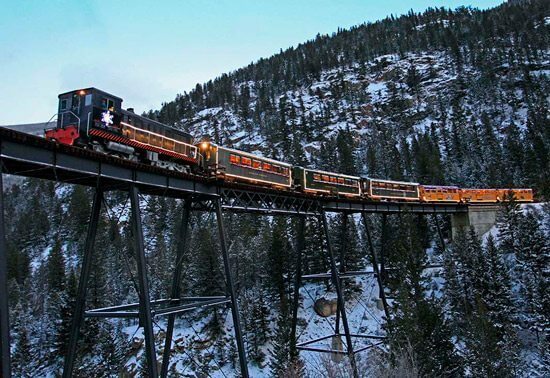 Georgetown Loop Railroad offers two special train rides for Christmas, the Santa North Pole Adventure and Santa’s Lighted Forest. These train rides feature a present-bearing Santa, and a beautiful light show set to synchronized holiday music. Colorado Railroad Museum is featuring its annual event, THE POLAR EXPRESS™ Train Ride. An experience where the story “The Polar Express” is performed in its entirety, along with dancing waiters serving cookies and hot chocolate, a visit to the “North Pole”, and Santa, handing out the “First Gift of Christmas” souvenir bells. The Royal Gorge Route Railroad offers the Santa Express Train ride. The Santa Express Train is a winter wonderland, where children of all ages are encouraged to wear cozy pajamas, sing along to a mix of new and old Christmas tunes, nibble on cookies and sip hot cocoa, and experience a visit by Santa and his special Elves, who board the train to pass out a special holiday bell. 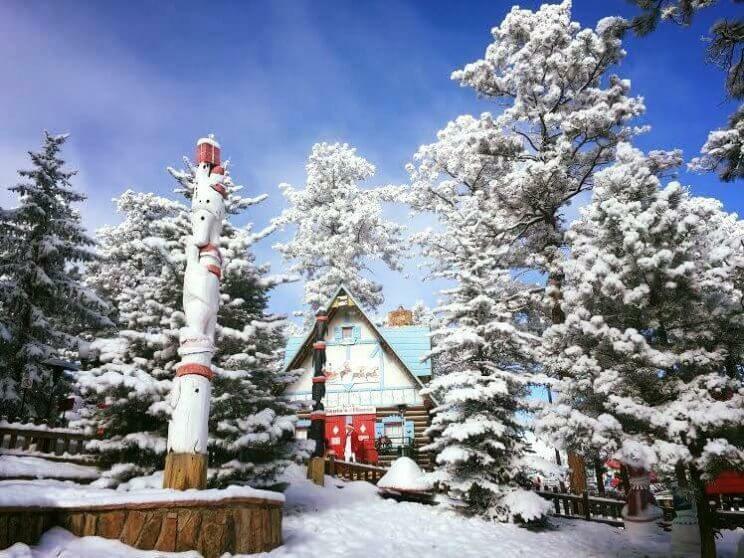 North Pole Colorado, Santa’s Workshop, is a Christmas-themed amusement park located at the base of Pikes Peak. Meet and take photographs with Santa Claus and his elves at Santa’s House and then venture off to explore the park’s many rides, shows and attractions. Ride on the unique Christmas Tree Ride, swing through the sky on the Enterprise Space Shuttle, and enjoy a whimsical ride on the Antique Carousel. You can fly through the sky on an Aerial Tram or stay on the ground with the Miniature Train. Spend time feeding goats and llamas, watch a magic show, or browse the quaint village shops stocked with unique gifts!